Any landing you can swim away from, it seems, is a good one. All 155 passengers and crew of U.S. Airways flight 1549, which was forced to make an emergency water landing in the Hudson River on Jan. 15, survived  making it the rare accident that airlines and the NTSB might look forward to investigating. Water landings (attempts to bring an aircraft down in a controlled manner on water) and water crashes (which are anything but controlled) are somewhat of a mystery to the engineers who design, build and study aircraft safety features and procedures. It's difficult to predict how an aircraft will hold up on impact and after crashing: will it break up and quickly sink, or stay intact and float long enough for passengers to evacuate, as it is designed to do? Variables such as the size and direction of waves, the altitude of the aircraft, and the speed at which it descends vary widely from one situation to the next. The men who saved flight 1549, pilot Chesley B. Sullenberger III and co-pilot Jeffrey Skiles, will likely find their brains picked thoroughly over the ensuing weeks, says airplane safety expert Todd Curtis. "This will be a data-rich situation from which we can learn." In the case of flight 1549, the pilots of the Airbus A320 made a decision to land in the Hudson River after apparently losing power in both engines. In aviation terminology, that type of landing is referred to as ditching, and as far as jetliners go it remains a fairly rare event. Curtis could only find three other instances when a flight crew of a commercial jetliner intentionally ditched a plane on water  and one of those occurrences that Curtis found, a 1963 incident involving an Aeroflot Tupolev Tu124 en route from Estonia to Moscow, yielded a 100% survival rate. "Every other crash  including some of the famous ones, like the one that happened 27 years ago this week with Air Florida in Washington and TWA Flight 800 and the Egypt Air event in 1999  these were all cases that the plane had clearly crashed in the water, but did so in an uncontrolled way," says Curtis. Water landings can result in fatalities as well; in 1970, an ALM airlines flight from New York's John F. Kennedy Airport to the island of St. Maarten ran out of fuel after missing three approaches in heavy weather, forcing the pilot to ditch in the Caribbean; 20 of the 57 passengers on board died, largely because no announcement was made to remind them to buckle their seat belts. In 1996, a hijacked Ethiopian Airlines flight over the Comoros Islands crashed into the ocean after running out of fuel; the pilot attempted to make a water landing while fighting off the hijackers. Of the 172 people on board, 45 survived. In addition to studying computer simulations of water landings, airline pilots also undergo training in flight simulators, according to Laura Brown, a spokesperson for the FAA. (They don't practice water landings in real planes for obvious reasons.) Most modern planes have controls that allow a pilot to close all air vents and openings in the plane to keep the aircraft buoyant in the water. Pilots are instructed to keep the nose up slightly, but not so much that the aircraft slams down roughly on contact. They also are supposed to keep the wings level to prevent one from being clipped by a wave, causing the aircraft to go into a spin or break apart. In the six minutes from the time flight 1549 struck what is now believed to be a flock of birds and when it touched water, the two pilots in the cockpit were tasked with deciding what options they had as they glided dangerously over northern New York City. The choice of landing in water likely seemed the best option considering those circumstances. Pilots are trained to bring planes in for a smooth landing on water the same way that they would on land, keeping landing gear stowed to make the plane more boat-like. They also have different ditching checklists depending on whether they are above or below 10,000 feet  Flight 1549 was at about 3,000 feet, leaving Sullenberger and Skiles a shorter checklist. But experts also note that a controlled landing on water can be more dangerous than a similar emergency landing on land. In a water landing, an aircraft's aluminum skin can bend and dent on impact, providing less protection for passengers. Crashing on a runway often crushes a plane's belly and undercarriage, which absorbs some of the blow. On the other hand, some emergency water landings (both uncontrolled and controlled) have had relatively minor fatalities. This TIME story from 1956 recounts the emergency landing of a Pan American non-jet plane in the Pacific Ocean, when all passengers and crew members made it out alive. In general, airplanes are designed to "float long enough" to get people off the plane, says Brown; in practice, the crew generally has about 90 seconds to evacuate. Still, debate endures over whether water or land accidents are more deadly, not least because of the still-fuzzy line between a water landing and a water crash. In a 2002 article, an expert quoted in The Economist noted that "no large airliner has ever made an emergency landing on water" and went on to dismiss onboard flotation devices as useless, considering the high likelihood of fatalities. 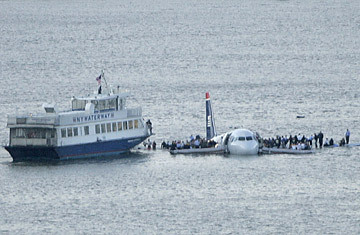 Patrick Smith, an airline pilot and author of Salon.com's "Ask the Pilot" column, later rebutted those claims, noting that a number of jets have landed on water and managed to bring some or all of their passengers to safety. "Any ditching is very dangerous, with the possibility of the airplane cartwheeling, flipping, or otherwise breaking apart," Smith told TIME. "But if you had to ditch, I can't think of a more opportune location: a relatively calm river adjacent to a large city with rescue equipment only moments away."